Glenn Cooper's outstanding style and tense, gripping storylines have done it again. 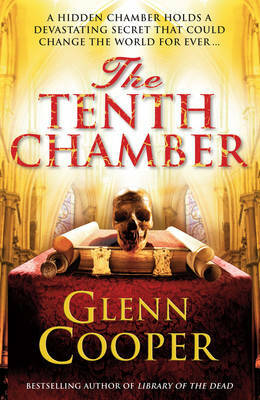 THE TENTH CHAMBER is this fabulous author's third book and is even more fantastic than his previous offerings. If, indeed, that is possible. As ever, I love the way he intertwines three different plots, from different periods in history, and produces a nail-bitingly exciting thriller that ends far too quickly but is impossible to read any slower. First, Tal, a pre-historic man and a powerful clan leader, accidentally makes an exhilarating magical potion that gives him special powers and helps him see visions. Filled with passion and energy, he produces amazing cave paintings to illustrate what he sees and his sons eventually join him in his art. Pretty soon he discovers that his potion has also gifted him with seemingly eternal youth but trouble is coming in the form of another species of early human. Not even Tal's potion can help him with this new threat. In the second story, medieval monks stumble upon Tal's cave, and his potion, with long-lasting effects for all of them. One of them, guilt-ridden, writes a coded book describing their findings and then hides it in a wall in the monastery, for people to find in the future. The book is then found in the third, present-day, storyline and has disastrous consequences for nearly everyone involved in it. Mysterious people want the book's, and the cave's, secrets to remain just that and will stop at nothing to ensure things remain this way. Meanwhile, Luc Simard, one of our central characters and a professor of archeology, is called in to analyse the book and happens across the hidden cave, and the potion, in the process. The marvellous way in which Cooper mixes the plots, and teases the reader piece at a time, is spellbinding. This drip-feeding of information makes the tension build delightfully and you end up trying to second-guess things, then feeling all silly and excited when things happen the way you predicted. I love the way we find out what happened to Tal, but the modern day scientists don't. We see him as a person while they just see his beautiful paintings and wonder at the significance of them. A truly wonderful book with a shocking and unexpected climax and an ending to make you smile and nod, THE TENTH CHAMBER is a definite must-read for all fans of historical/religious crime fiction. I am eagerly awaiting the next instalment from this brilliant author. Read another review of THE TENTH CHAMBER.